Photographic theme: More images from my recent SUV trip. Canon 600mm f/4L IS lens (on the Wimberley head/Gitzo 3530 LSV CF tripod) with the 1.4X II TC and the EOS 1D MIII. ISO 400. Exposure determined by histogram check: 1/1250 sec. at f/7.1. 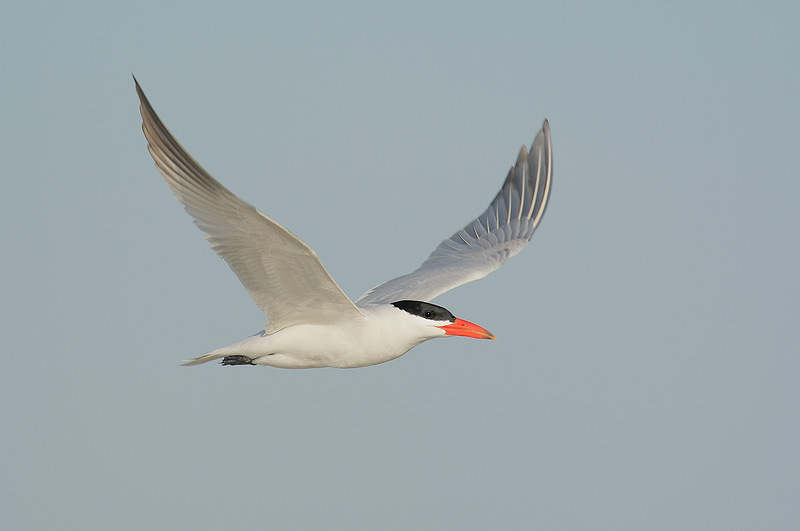 With a nice breeze from the northeast flight photography was very good with the birds for the most part angling towards us. In the last BAA Notes, I let folks know that there are still and will be great opportunities to make great images aboard James Shadle’s great pontoon boat Hooptie Deux. On Friday morning I joined Doug Holstein for a day of fun at Alafia Banks. 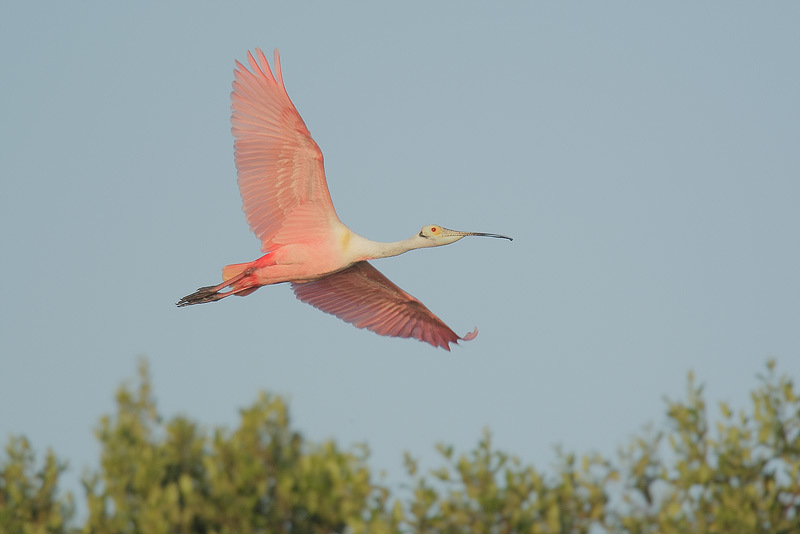 And on Sunday, we are headed to a rookery near Plant City, FL where I expect that we will do quite well. 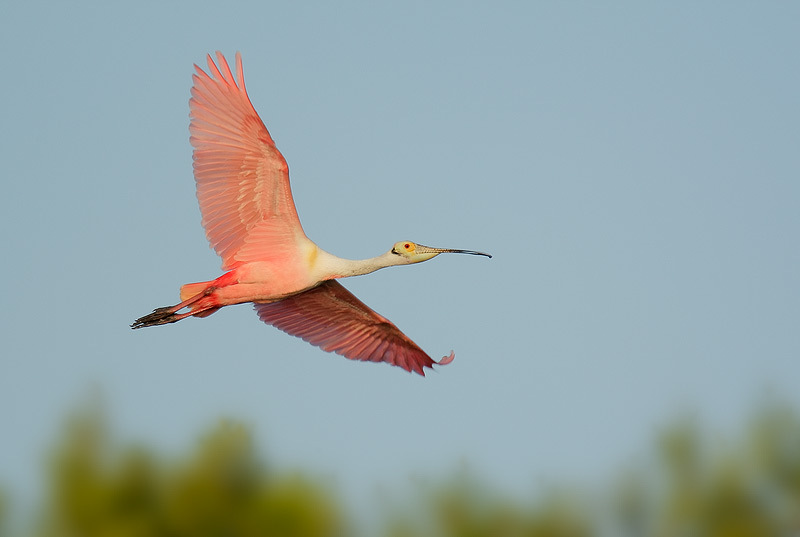 If you would like to check dates, prices, and availability you can contact James by cell phone at 813-363-2854 or via e-mail at james@birdphotographers.net or james@wildflorida.net. With all the hoopla about whether or not the EOS-1D MIII can focus accurately (especially in bright sun), I decided to simply concentrate on panning smoothly and keeping the central sensor on the bird. In addition, I made sure to raise my tripod so that the camera was at my eye level, to level the tripod platform, and to assume a comfortable stance. It turned out to be an excellent plan as most every flight image that I created was either sharp or razor sharp on the eye. My three MIII bodies are all early releases, and each has had Firmware 1.1.3 installed and has been back to Canon for the sub-mirror assembly fix. I will, however, admit to having a favorite among the three. The more recently released MIII bodies that feature a blue dot on the box to signify their more recent date of manufacture, are reputed to feature more consistent AI Servo AF performance. How much of the MII focusing fanfare is due to operator error? Good question. Do check out the flight images here. Canon 600mm f/4L IS lens (on the Wimberley head/Gitzo 3530 LSV CF tripod) with the 1.4X II TC and the EOS 1D MIII. ISO 400. Exposure determined by histogram check: 1/1000 sec. at f/6.3. As described in “The Art of Bird Photography II,” I have exposed to the right (properly) giving the image a washed out look. Simple Levels and Hue/Saturation Adjustments as described in ABP II and in Digital Basics, took just a minute. I selected the mangroves with a Quick Mask and did a sizeable Gaussian Blur to give them the soft look in the optimized image which appears the original. Jodee Novak posted this somewhere: “This site is absolutely amazing; $20 for membership??? It's a steal....the insight and knowledge available to us on this site is priceless. Thanks for providing a learning forum for all of us - you have all done an incredible job! I'm a BPN junkie!!!!!!!!!! In a thread here: http://birdphotographers.net/forums/showthread.php?t=5596, Cindy Cone wrote: “Artie, I missed this thread earlier, so I'm just responding to it now. Thanks for your thoughtful, helpful comments here and for this entire forum. It has already been extremely helpful to me. I appreciate that the critiques, the comments to help us to learn and grow (not just to feel good like the pats on the back you get at so many other forums). Haim Ziv’s Common Cuckoo portrait in soft light is simply stunning: http://birdphotographers.net/forums/showthread.php?t=10512. When the image opened, I gasped. Juan Aragonés’ displaying Great Bustard is in my top ten all time favorite bird images: http://birdphotographers.net/forums/showthread.php?t=9830. To sum up, the quality of the images being posted at BPN is second only to the quality of the (gently done) critiques. 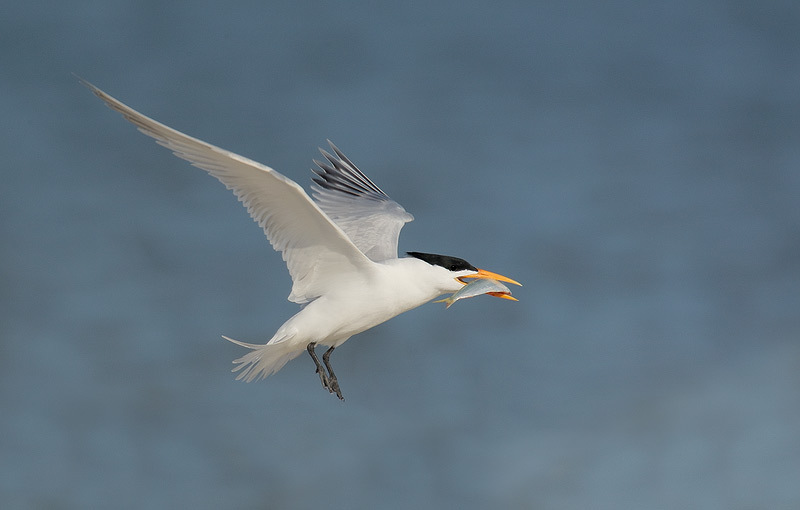 Gull-billed Tern is uncommon in Florida but regular in spring and summer around Tampa Bay. 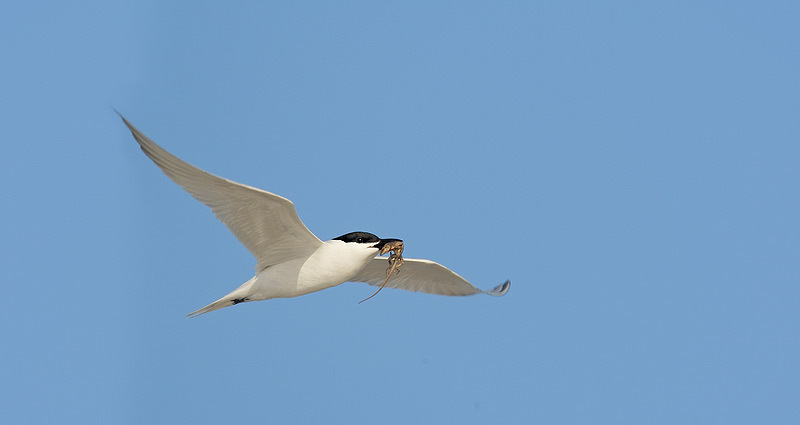 When we saw this one flying towards us with a prey item, I about had a cow! Canon 600mm f/4L IS lens (on the Wimberley head/Gitzo 3530 LSV CF tripod) with the 1.4X II TC and the EOS 1D MIII. ISO 400. Evaluative metering +2/3 stop: 1/400 sec. at f/11set manually. 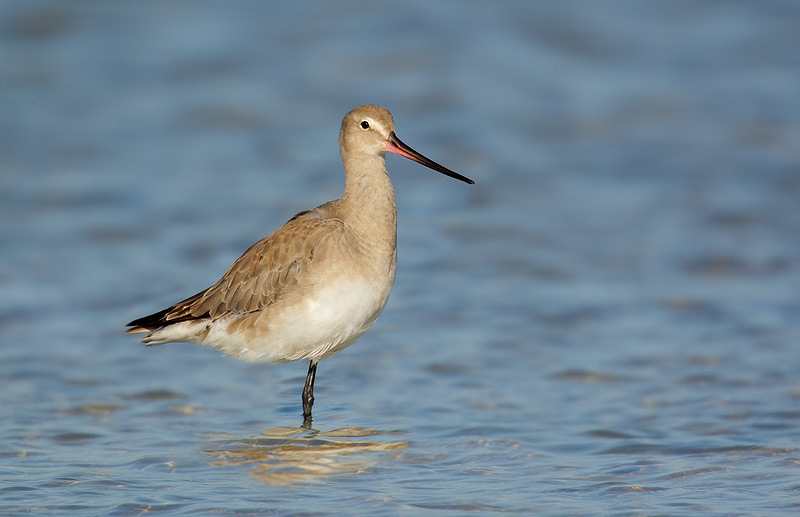 Original file: Hudsonian Godwit. See optimized image two below. I moved to my right in order to get some separation between the subject’s tail and the head of the o-o-f Marbled Godwit (foreground left). Canon 600mm f/4L IS lens (on the Wimberley head/Gitzo 3530 LSV CF tripod) with the 2X II TC and the EOS 1D MIII. ISO 400. Evaluative metering +2/3 stop: 1/800 sec. at f/9 set manually. This is the very first time that I have used and entire specially created background in this manner. Working with digital capture and learning to use and think Quick Masks has opened up new worlds. You can learn more about Robert O’Toole’s Quick Masking techniques on his APTATS PFD: http://www.birdsasart.com/aptats.htm. And you can learn a ton more by attending the next BAA Weekend Seminar in Portland, ME this coming fall. See item below for details. I almost forgot to mention that this species is rare in Florida. 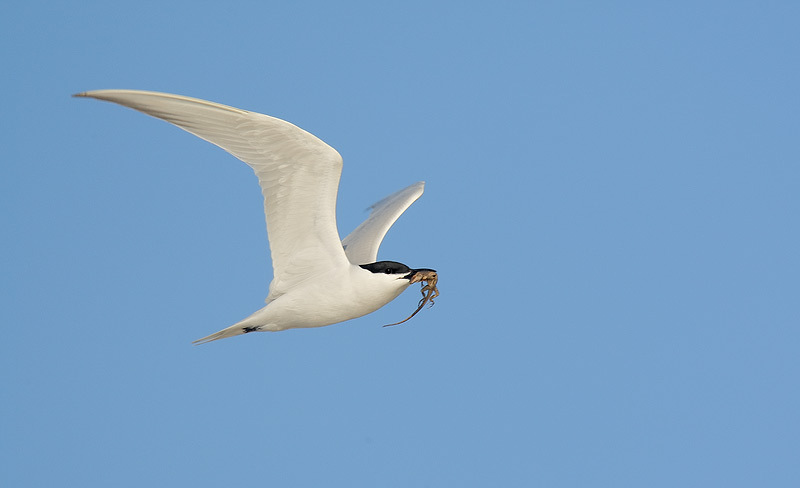 I identified it as it slept; it was as large as the Marbled Godwits that surrounded it. The white belly alerted me that it was not a marbled and the strong white eye-line confirmed it as an Hudsonian. 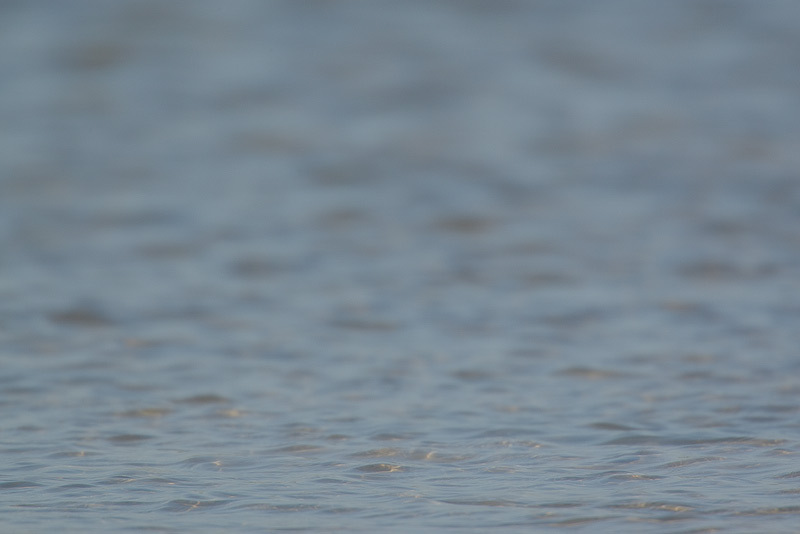 To learn stuff like this and lots more about shorebirds, consider getting a signed copy of my “Shorebirds: Beautiful Beachcombers.” (http://www.birdsasart.com/books.html#SHOREBIRDS) Lastly, do note the perfect head angle. This seminar is for all nature photographers who want to learn how to make better photographs. On Saturday I will describe the methods and techniques that I have developed and used since 1983. My comments on lenses and digital camera bodies, AF, light, and on composition and image design will be highly informative and educational. And my tips on getting close to free and wild subjects and creating pleasing blurs will help you become a better photographer. Everyone with a telephoto lens who wishes to dramatically improve the quality of their images will benefit from attending. Since going all-digital in November 2002, I have—with the help of many wonderful friends—become somewhat of a Photoshop expert. My approach to optimizing images is to create master files of excellent quality in the shortest possible time. I will share our workflow and numerous Digital and Photoshop tips on Sunday. As more and more folks are using Digital Capture, I am finding on our IPTs that many good to excellent photographers have no clue as to how to use Photoshop to make their images look better. In fact, many of them make their best images look worse! I can and will teach you to do just that at this seminar. 2- Call us with a credit card: 863-692-0906. 3- Send us a Paypal (using either any link on our site or your Paypal account) to us at birdsasart@att.net. Canon 600mm f/4L IS lens (on the Wimberley head/Gitzo 3530 LSV CF tripod) above with the 2X II TC, below with the 1.4X II TC, and the EOS 1D MIII. ISO 400. Exposure determined by histogram check: above: 1/1250 sec. at f/9, below, 1/1600 sec. at f/8. Creating sharp flight images of fast flying birds with the 2X TC is not something that I do every day so I was very proud of the image above. 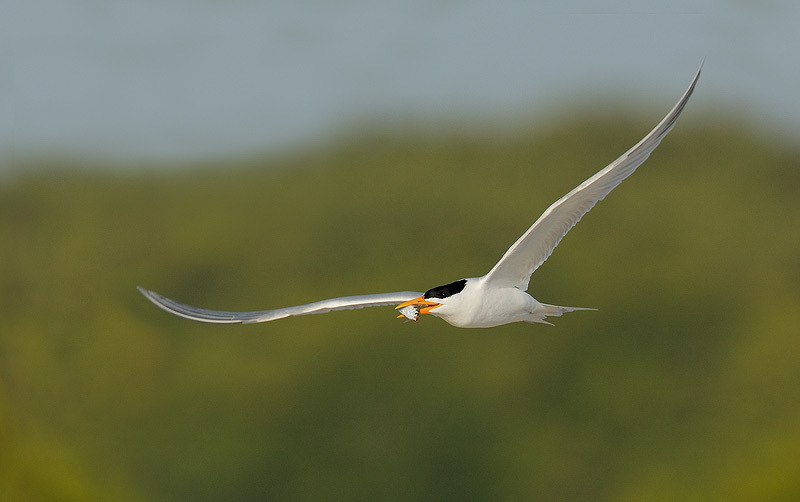 The terns are actively fishing and courting in late April and early May. Thanks Froggie! 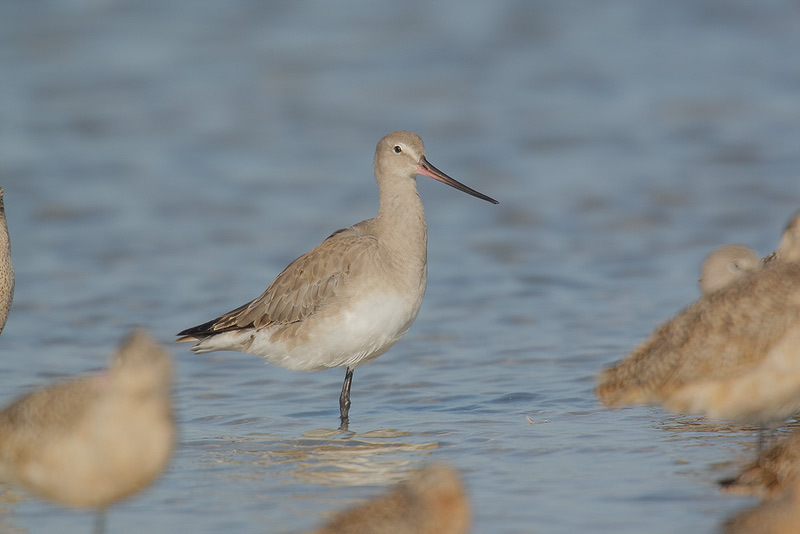 Ps: The Hudsonian Godwit is the tenth bird in from the left, sleeping in the first row in front of two Marbled Godwits.